Physician, naturalist, and poet; born about 1691 in Bragança, Portugal; died at London in 1761. At the age of seventeen he entered the University of Evora, to study philosophy, and later studied medicine at Coimbra, receiving his baccalaureate in 1717. In order to escape the persecutions of the Inquisition, Henriquez—so-called as a Marano—went to London in 1720; there he continued his studies in medicine, physics, and chemistry, and passed his examinations in the theory and practise of medicine. He was elected a fellow of the Royal Society of London about 1725, in recognition of his having introduced a new medicine for curing fevers. Castro Sarmento corresponded with many scholars, among others with Prof. Mendes Sanchetto Barbosa of Lisbon, who reported to him the terrible earthquake that destroyed the capital of Portugal in 1755, and with the Jesuit B. Suarez, who communicated to him his astronomical observations made in Brazil. 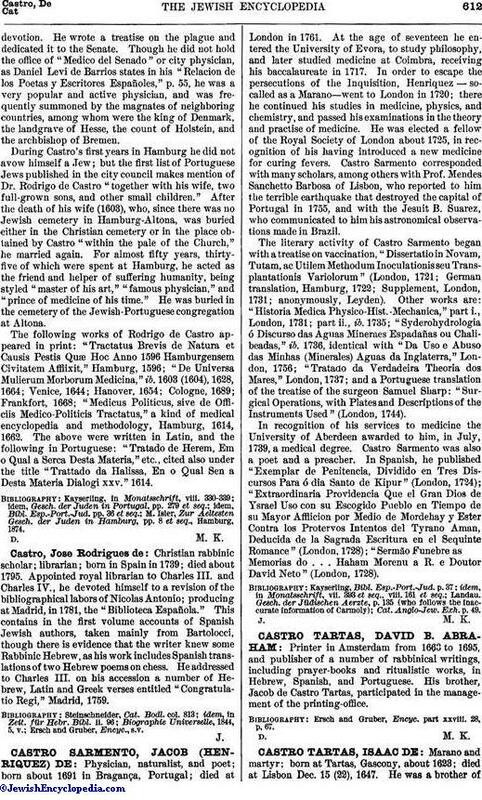 The literary activity of Castro Sarmento began with a treatise on vaccination, "Dissertatio in Novam, Tutam, ac Utilem Methodum Inoculationis seu Transplantationis Variolorum" (London, 1721; German translation, Hamburg, 1722; Supplement, London, 1731; anonymously, Leyden). Other works are: "Historia Medica Physico-Hist.-Mechanica," part i., London, 1731; part ii., ib. 1735; "Syderohydrologia ó Discurso das Aguas Mineraes Espadañas ou Chalibeadas," ib. 1736, identical with "Da Uso e Abuso das Minhas (Minerales) Aguas da Inglaterra," London, 1756; "Tratado da Verdadeira Theoria dos Mares," London, 1737; and a Portuguese translation of the treatise of the surgeon Samuel Sharp: "Surgical Operations, with Plates and Descriptions of the Instruments Used" (London, 1744). In recognition of his services to medicine the University of Aberdeen awarded to him, in July, 1739, a medical degree. Castro Sarmento was also a poet and a preacher. In Spanish, he published "Exemplar de Penitencia, Dividido en Tres Discursos Para ó dia Santo de Kipur" (London, 1724); "Extraordinaria Providencia Que el Gran Dios de Ysrael Uso con su Escogido Pueblo en Tiempo de su Mayor Afflicion por Medio de Mordehay y Ester Contra los Protervos Intentos del Tyrano Aman, Deducida de la Sagrada Escritura en el Sequinte Romance" (London, 1728); "Sermão Funebre as Memorias do . . . Haham Morenu a R. e Doutor David Neto" (London, 1728). Cat. Anglo-Jew. Exh. p. 49.